Israeli Couscous with Beets, Garlic Scapes, and Orange | A Bushel of What? We just returned from a lovely week on Nantucket. I cannot say it was relaxing in the pre-baby sense, but it was a great adventure filled with lots of beach-lounging, quality time with one of our favorite couples, and plenty of food. The husbands decided the best way to celebrate our week on the island, and to put us all in the appropriate Summer Mood, would be to to choose two burgers from the Cheese and Burger Society and "bookend" our trip with burger-tastic meals. Grilling = Summer, so I couldn't have agreed with their idea more, but after chowing on two ridiculously huge burgers in six days, I'm beefed out. In case you're wondering, Night One's burger was The Gypsy (#9), and Night Six's burger was supposed to be The Casanova (#1), but the men ended up concocting a burger of their own after surveying what was left in the fridge from our week's stay. The end result? 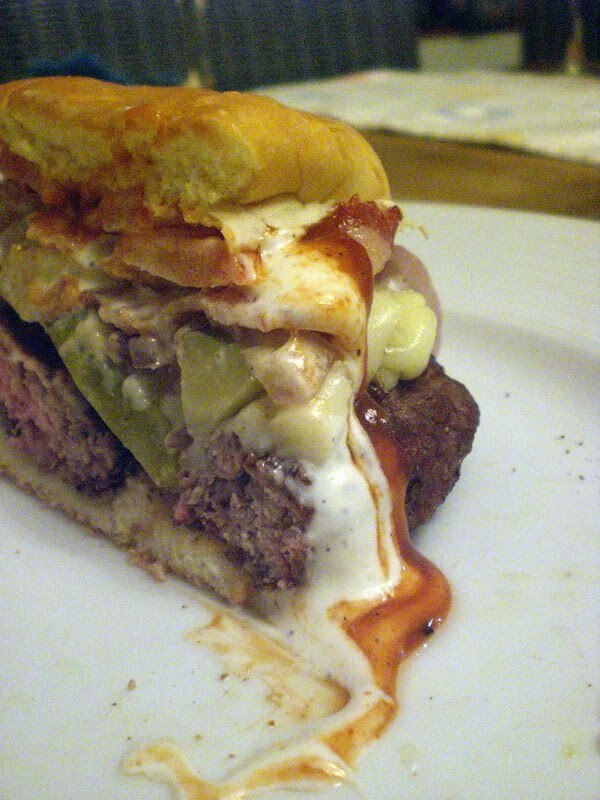 Beef burger, grilled, with sliced dill pickles under melted American cheese, topped with bacon, sauteed red onions, lettuce, tomato, bbq sauce and ranch dressing, all on a delicious grilled bun. Based on the photo that David took (see photo on right), he thinks it should be called The Quasimoto. Heart attack on a plate? Sure, why not. When we weren't clogging our arteries, we grilled healthier meals, trolled the island for lobster rolls (my best find was a fancy-shmansy lobster salad on grilled challah from The Straight Wharf, and indulged in a delicious dinner AND breakfast (not consecutive meals, in case you were wondering) at Black-Eyed Susan's. For our snacks/lunches at the beach, we stopped in at Bartletts Farm. The inspiration for my recipe comes from an Israeli Couscous, Beet and Shallot salad that my friend picked up while shopping at the Bartletts Market. I never actually got a chance to try the salad, but the beets-and-couscous combination stuck in my head. Upon returning home I decided to give my take on the salad a go. It's quite tasty and perfect for these ridiculously hot days. It's also NOT 10,000 calories like those burgers we ate last week, which is a very good thing. In a saucier pan, heat olive oil and saute garlic scapes approx. 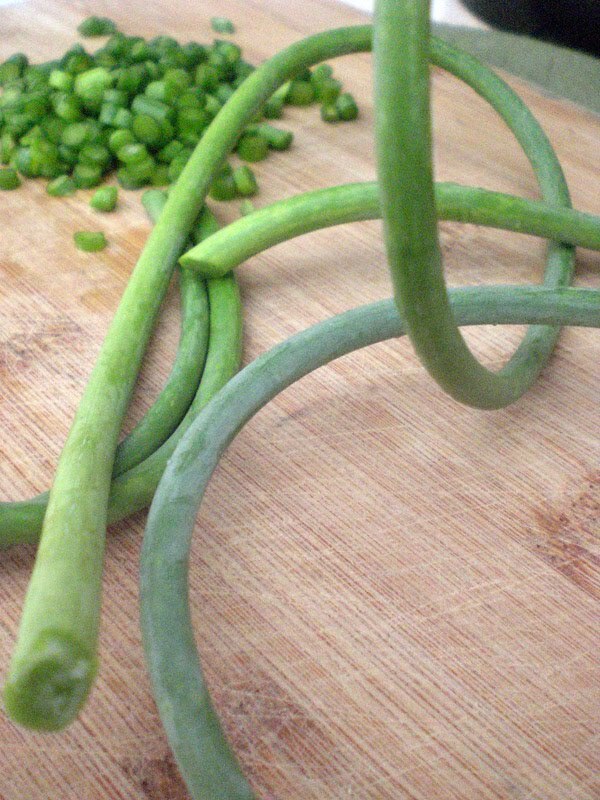 3 minutes, or until they are fragrant and start to soften. Add couscous, stirring frequently so that the couscous gains a toasted golden color, approx. 5 minutes. Add water and bring to a boil, then turn heat to low, cover with lid and let the couscous simmer until it soaks up the water and the couscous is tender. Remove the couscous from heat and transfer to a bowl. Once the couscous has reached room temperature (or go ahead and stick it in the fridge for a bit), add the beets, orange, and parsley. Squeeze the lemon wedge over the salad, and toss to combine. Add salt and pepper, as needed. 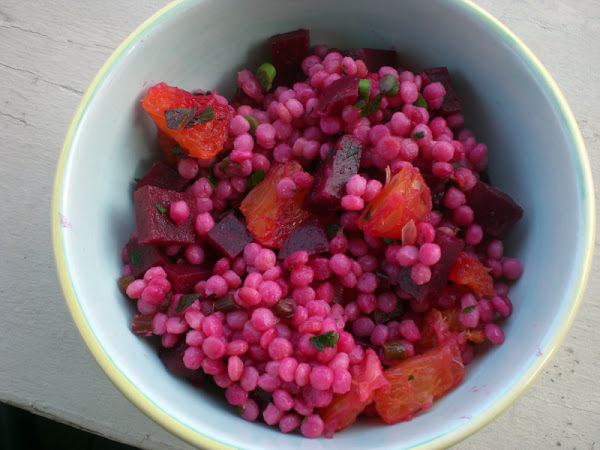 Marvel in how the beets turn the couscous a lovely magenta, and how that color is complimented by the orange pieces. Ahh, how I love those colors together! *I hate, hate, hate removing the skins and piths from oranges, but it's better in salads when done so. I find that using a knife to cut away the peel also removes much of the outer skins, allowing the juices of the orange to meld better in the salad. Ignore, just testing a comment.